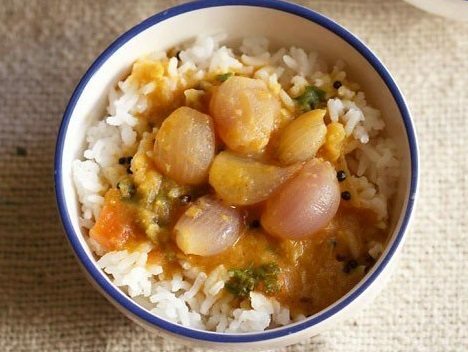 easy sambar made with pearl onions or small onions. rinse 1/2 cup tuvar dal for a couple of times in water. then add the lentils in a pressure cooker along with 1/4 tsp turmeric powder. stir and pressure cook the lentils for 7 to 8 whistles or till they are cooked completely. when the dal is cooking, soak 1/2 tbsp tamarind in 1/2 cup hot water for about 20 minutes. later extract the pulp from the tamarind and keep aside. also soak the pearl onions in water for about 20 to 30 minutes. let the pressure release from the cooker on its own. open the lid and check the dal. if the the dal is softened and cooked really well, mash the dal and keep aside. later peel the pearl onions and keep aside. also dice the tomato. heat 2 tbsp oil and add 1/2 tsp mustard seeds along with 1 tsp urad dal. allow the mustard seeds to splutter and the urad dal to change into a maroonish color. then add 2 dry red chilies and 3 to 4 fenugreek seeds. saute till the red chilies change color. next add the pearl onions and curry leaves. stir and saute till the onions turn translucent. add the diced tomatoes and a pinch of asafoetida. stir and saute the tomatoes till soften. add the tamarind pulp to the onion - tomato mixture. add water and stir well. bring this mixture to a simmer till the raw smell of tamarind goes away. then add sambar powder and stir very well. now add the mashed dal and stir again. simmer vengaya sambar for 5 to 6 minutes. garnish with coriander leaves if you want. serve small onion sambar with steamed rice or idli, dosa or uttapam.